When it comes to presidential candidates, a little analysis of their formative influences is understandable. These people might be running the country; what made them who they are? What personalities, historical and otherwise, contributed to their current path and beliefs? In the case of Hillary Rodham Clinton, the answers often include men: the topic of her senior thesis at Wellesley, for example, was radical community organizer Saul Alinsky, with whom she corresponded regularly. But there are, in Rodham's past and intellectual history, various powerful women, from activists to New York teenagers, who've made a definite contribution to her shaping as a politician. And that makes for some very interesting reading. The interpretation of an "influence" is very flexible. Clinton herself has said that her granddaughter Charlotte, her daughter Chelsea's firstborn, is one of her biggest campaign inspirations for the 2016 presidential run, and in April she hailed the female American soccer team and their fight for equal pay as role models and political drivers. But this list narrows her acknowledged female mentors and influences down to five, all of whom she's openly discussed, and all of whom are part of an American legacy of female participation, leadership, and activism. That doesn't mean this doesn't get personal, but it does give us a bit more focus. So here are five of the biggest female influences on Hillary Clinton's political thought, ambition, and principles, whether they kick-started an important stage, gave her a new perspective, or contributed old wisdom. In Clinton's personal biography, the largest shaping influence in her early life and pursuit of an active intellectual career is a constant force: her mother, Dorothy Rodham, who had survived what the New York Times described (with understatement) as a "devastating childhood" (poverty, rejection, and manipulation by her parents, abuse by relatives, and grueling work as a teenage housekeeper to support herself). Rodham would eventually marry Clinton's father Hugh, a Republican, and have three children, but her wish for a college education for herself was never fulfilled; the Times mentions, heartbreakingly, that Rodham's mother promised to pay for college tuition to "lure" Rodham back to the family home, with no intention of following through. In her autobiography Living History, Clinton mentions her mother's training against bullies: "You have to stand up for yourself. There's no room in this house for cowards," was Rodham's advice. And her mother continues to be a touchstone when it comes to questions about inspiration; she referred to her in 2008 as a woman "who never got a chance to go to college, who had a very difficult childhood, but who gave me a belief that I could do whatever I set my mind [to]." Clinton has had a somewhat complicated relationship with one of the most notable of her female mentors: Marian Wright Edelman, the famous activist who founded the Children's Defense Fund to fight for the rights of underprivileged American children. Edelman was in charge of the CDF in 1973, when she hired Clinton, then a Yale Law graduate, as staff attorney, and got her involved in data collection: door-knocking in poor neighborhoods in Massachusetts to get information on local children. This isn't perhaps surprising, considering that the wife of FDR is one of the biggest luminaries in the history of American politics; but Eleanor Roosevelt is definitely name-chcked by Clinton as an influence on her own perspective and career. Roosevelt was an eminently quotable person (though her most-attributed quote, "Nobody can make you feel inferior without your consent," may be a condensed version of a longer, less quotable sentence). But Clinton mentioned one aspect in particular when giving a speech to the Eleanor Roosevelt Legacy Fund back in 2007: "She said, 'You know, if you're going to be involved in politics you have to grow skin as thick as a rhinoceros'. So occasionally, I'll be sitting somewhere and I'll be listening to someone perhaps not saying the kindest things about me. And I'll look down at my hand and I'll sort of pinch my skin to make sure it still has the requisite thickness I know Eleanor Roosevelt expects me to have." Margaret Sanger is a woman with a complicated legacy. A hugely influential activist for women's contraceptive rights who opened America's first birth control clinic and founded what would become Planned Parenthood, she also held some worrying views on eugenics, sterilization, and racial equality. It was Sanger's monumental achievements as an activist in the fight for female birth control that Clinton specifically singled out as admirable and influential when she accepted the Margaret Sanger Award from Planned Parenthood in 2009. “I admire Margaret Sanger enormously, her courage, her tenacity, her vision," she said at the time. "And when I think about what she did all those years ago in Brooklyn, taking on archetypes, taking on attitudes and accusations flowing from all directions, I am really in awe of her.” As one of Clinton's main platforms is support for birth control and abortion rights for women around the world, that only stands to reason. You've probably never heard of her, but Clinton revealed in January 2016 that Sofia Totti, who was a teenager at the time, inspired her at an event at a New York high school in 1999. Clinton was then promoting the documentary Dare To Compete, about female sports stars, and contemplating entering the 2000 senatorial election. A girl named Sofia Totti ("I think she was like the volleyball or basketball captain," Clinton remembered on MSNBC) introduced her. 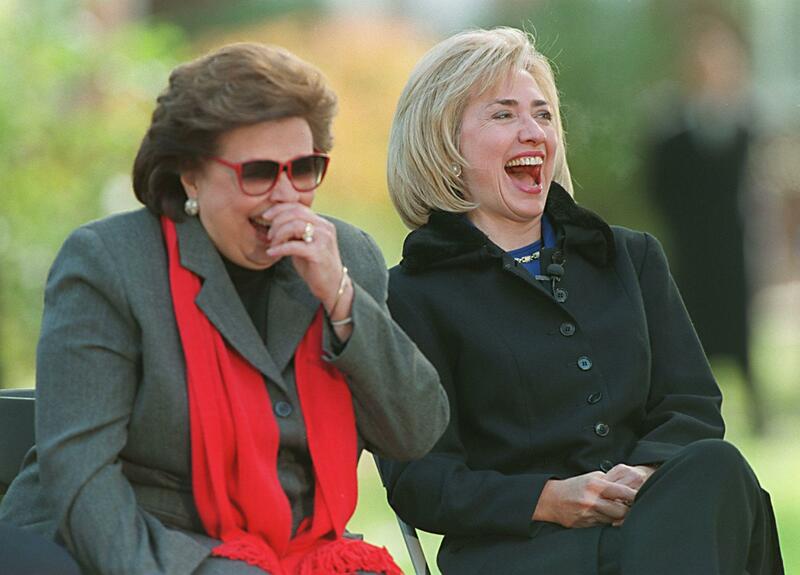 "She leaned over to me and she said, 'Dare to compete, Mrs Clinton, dare to compete.' And I thought, 'Wow.'" The BBC points out that the anecdote also features in her autobiography, Living History , with a follow-up interpretation: "Her comment caught me off guard, so much so that I left the event and began to think: Could I be afraid to do something I had urged countless other women to do? Maybe I should 'dare to compete.'" The rest, of course, is history. Totti, now Totti Bernardin, is an entrepreneur who's worked for Vogue, so she evidently took her own advice.